The physical/material beginning of things – the ultimate and successful completion of physical/material matters to the highest standards. It is time for you to ground your creative energy into material gain, contentment and the fulfillment of your hopes, wishes and desires. Allow yourself to experience the ultimate balance – mental, emotional, spiritual and physical success resulting in a joyful life. Bring together all your internal and external resources and talents. Everything is great now and successful ventures are possible if you start with a good foundation. You have the stability and skills required to get results. You can silently visualize your hoped-for results, decide how to use them in a new way and then stubbornly keep at it until you see it in final form. Experience the fruits of your labor – it is your spiritual work which leads you to recognize the magic in normal things. Move beyond that to an even greater knowledge. When you are ready, the Gateway will always open to the truth. You will receive important information soon. Set your goals, plan how to achieve them – then act on your plans. Nurture them with patience – complete the task and reward yourself. Perfection – blessings and good fortune. Excellent health. The possibility of new business ventures or a new physical regimen. Accept your physical prowess, your superiority. Experience your independence and self-sufficiency – your ability to provide, to produce. It is time for you to express your greatest physical potential. In the first position: Life will require substantial achievement in physical and material matters. In the second position: Abundant resources. Good health record. Support systems in place and working. In the third position: Material/physical success in the offing. Enjoy – a new beginning or successful completion with great satisfaction on the Physical/material Plane. Realize and accept the strength of your position. It is important for you to begin or finish on time. In the fourth position: Desire to be first, to make things happen, to be successful materially/physically. A passion for setting records or for physical perfection. In the fifth position: Planning a new start, new venture or completing an old one. Cashing in your chips, liquefying assets, mobilizing resources for a new phase. Content with your physical/ material situation. Physical/material plans are solid. In the sixth position: Pressure of success, effect on relationships and/or creativity. Pressure/effect of new start. Desire for truth and deeper understanding of material world. Environmentalism asserts itself. In the seventh position: Excitement, lure of a new venture. Test of your resolve. Drawn to material/physical perfection. In the eighth position: Success, good health and rewards are at hand. Major departure or new beginning. 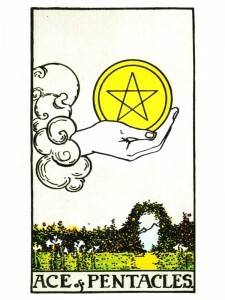 In the ninth position: Yearning for a new beginning or a successful completion in the Physical Plane. Enjoyment of or desire for good fortune, good health, physical prowess. In the tenth position: This information will help you with implementing the healthy challenges of a new venture. Knowing your Material Plane will be graced is to allow your attentions to focus on the other planes. 3 Aces in a reading: swords in the present, cups in the near future and pentacles as outcome….is there significance to this? How do I know what position my card was in? Am I understanding it to be in the first position? Thank you!